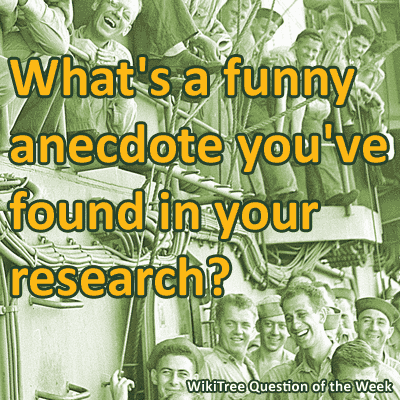 Question of the Week: What's a funny anecdote you've found in your research? I remember my uncle saying that he would always eat with one hand guarding his plate because his siblings were always picking food off his plate! He was the youngest. Me and my older brothers would play what we called "mailbox" with our youngest brother, have him put his Burger King chicken sandwich in our mouth as a mailbox and we would take a bite! He fell for it each time! Ooo, CB, you soooo bad! Amid all the crazy, sad and weird stories I've found in my research this one is kind of funny. I was checking out something about my great-grandmother, Henrietta Legault. Since my mother remembers her, I asked her if she could tell me more about her. After all I grew up surrounded by my dad's side of the family. I asked if she cooked anything French-Canadian since that was her heritage. The following conversation happened. Me: So, did she cook anything French? At all? Mom: No. Not unless you count pea soup. Mom: Yeah. Your uncles weren't very fond of it. Me: Did you like it at least? Mom: It was okay. We just never really did a lot of French cooking. Me: No Julia Child, huh? I can't help but picture the lot of them around the table trying to eat this green fluid. My mom is one of six. So picture if you would six kids trying to eat that stuff. The image I have in my head is kind of hilarious. Suggest you send them a can of Habitant Pea Soup. It's yellow and very popular in Canada. Very French Canadian. Ah Chris - pea soup is really good... Never thought of it as French, rather as Yankee. Start with a ham bone and lots of ham. Add an onion, a few carrots cut up, a pound of split peas (yellow are best), salt and pepper, couple of bay leaves, cover with water. Simmer, stir occasionally. It should not be watery, but the consistency of a thick porridge. @Kay - That's a popular Dutch dish. It's not ready until the mixing spoon can stand up in it. When I was very young, still in a tall chair with a built-in table is a likely memory, My mother and I had our very first, quiet arguments. I'd eat all my food, except I always left "the green stuff." In trying to talk it out with me, I was pushed to my limit and finally told her that green things weren't food, with all due and solemn certainty. It was a continuing stand-off. She'd cook the green stuff and put it on my plate. I would not eat the green stuff. That went on for a very long time. But once I owned up to liking the peas best of this food for horses. So she gave me more peas. Even now, I'm not keen on salads or spinach, asparagus included. This is one I posted in the Weekly Chat a while back but is worth repeating since Census Records are so important to us all. I found this while searching the 1850 Panola County, Texas census. Now you know why your ancestor family can't be found or the ages don't match or a bevy of other issues. I remember that one! Funny as the dickens! LOL - I love it! Yeah, it kinda explains the census in a nutshell. I really loved finding this one!! Jack’s book is filled with stories like that. Really puts meat in the bones of bare facts. It does put that meat on the bones! I'll bet that kind of family feuding went on a lot that we don't know about. Some of the most hilarious stories I've ever read were in Jack's book. I just wish someone on my side had done that. I got in the game too late and wasn't smart enough to ask those questions though there were a lot of oldtimers around when I was growing up. Here’s a story from my grandpa. He once told me about a man named Hoover who apparently was into something that the Session of the Paw Creek Presbyterian Church didn’t approve of. They told him (Hoover) he was going to be brought before the Session. Hoover replied that if they did, he would tell about several so-and-sos on the Session doing such-and-such. He wasn’t brought before the Session. Was contacted by someone from Austrialia regarding my Ludford Family Tree . He gently suggested my record was wrong, we shared the same ggrandfather but the wife was another person. I replied , sending him the marriage certificate and explained that our ancestor had married my ggrandmother then abandoned her to live with his ggrandmother. He replied " Well, I guess I am what everyone has always said I was!" My grandaddy bit a man's ear off in a bar brawl. What happened was (according to my grandaddy) he was dancing with a woman in the bar when a man got between them and got in grandaddy's face. Turns out the woman was HIS woman. Well, grandaddy tried to tell him he didn't know that, but the man wasn't having it. They started grappling with each other, and grandaddy got him into a headlock and just chomped the guy's ear off. Anyway, year later, grandaddy went to see a movie. Sitting in front of him in the movie theater was a man with one ear missing. Grandaddy leaned forward and asked him, "Scuze me, friend, but mind tellin' me what happened to your ear?" The man in front of him says, "Some son of a b!tch bit my ear off, and if I ever find him I'll--" and grandaddy nearly broke his leg running out of that movie theater. One of my great-aunts was so drunk at the time she was beaten by someone that she couldn't tell the police which of their suspects was the culprit. She slipped into a coma and died, so her assailant got off. While this experience is horrific for my aunt and her family, it was presumably hilarious for the culprit. Thankfully, God knows who that culprit was. This story does Not sound funny to me. During my research in old church records (19th century) I bumped into entry where the preacher made the effort to complain about a couple who was rejecting to become married, but rather "continued to live in sin". This entry was made next to the children that were born out of that connection. The preacher was trying to convince his successor to take measures against these unruly people. Apparently he was raging with rage, as this couple had already two children and he did not have any means to stop them. My personal favorite is in a newspaper article I ran across about my great-grandmother's brother Buck Wade. Seems Buck was driving his horse and buggy along the road--one of those roads with a big drop-off on one side--when along came one of those newfangled automobiles, spooking his horse. The horse took off running, right toward the cliff. Buck jumped out just in time, but the horse and buggy went over the cliff. The buggy was destroyed, but the horse landed in a tree, no worse for the experience! The article didn't explain how they got the horse out of the tree, but I sure get a lot of giggles imagining the process. Victor was already his middle name. His siblings got a big kick out of that. Of course, they got a big kick out of everything! Also, speaking of Pee Wee. My grandmother already had a son when they married. So one day my grandfather was on the roof fixing the antenna or something. Grandma came out calling in her high-pitched way, "Peeeee Weeeee!" Uncle Bob (about 3 or 4 years old) told her, "Pee up a ladder!" My grandmother grew up best friends with her double cousin (two brothers married two sisters, so they shared the same four grandparents). They would argue over several things, one of which was who had the most relatives, "I've got one more brother! ", "I've got one more cousin!" My mama, grew up on a farm, but what you don’t know is that she should have been born a city girl. She was afraid of cows and no matter how much she tried, she could not wring a chicken’s neck, it would get up and walk away! She’d have to call her baby sister who was about 8 years younger to do it for her. My aunt loved telling that story. "Use records to tell the tale. Use them not to tell tales"
My 6x great-grandfather Joseph Inman was a skunk who abandoned his young family and took up with his wife's cousin. My 6x great-grandmother successfully sued him for divorce. Flash forward 25 years to 1801. Joseph was accused of murder of Oliver Homes by his son, who claimed to have seen the dead man's ghost while drinking in a tavern. No body, no blood, no evidence, just a ghost story. He was actually convicted and sentenced to hang when the dead man showed up. Homes had been visiting relatives. The judge in the case, who knew both men by sight, spotted him in a neighboring town and told him to ride back as fast as he could. My family got a big smile and a bit of a laugh out of an entry about our ancestor that I found in a newspaper "gossip" column stating that he was sporting a new coupe "so look out girls". Most of us who knew him usually only saw him as a quiet, reserved man and we never heard stories about his "pre-marriage" days. This statement along with some other "gossip" column entries talking about his accompanying different females to dances make us wonder if he wasn't quite the ladies man in his youth! However a heartwarming story is that of a cousin Vere Hunt, a distinguished and early 19th century progressive Irish lawyer. As he was coming into court a bit early for a case. It was about to enter the sentencing phase and after a very quick update from a a judicial court - a good man about to hang for the crime of purloining a bit of bread for his famine struck family and neighbours - suddenly spoke to say he might have new evidence which would need review with the defendant and requested and was granted a half hour recess to do so. After lunch, he took the stand himself to testify that for as long as he knew the man, that he was otherwise a man of integrity seeking to do the best for others even sometimes at his own expense and would likely pose no more difficulty in the future . My grandfather was a very quiet man, not prone to raising his voice. In 1948 their farm was threatened with flooding. They moved all cattle they were not milking to another farm and carried on, hoping the dyke would not break. They had two options to get out and the Army, in place to help, had determined which route they would use. When the dyke did break, the water came in on the army's chosen route. As Gramps, Dad and my Uncle were herding the cows to safety on the other route they were stopped by a young soldier and ordered to go the other route. No amount of reasoning could convince him that route was already flooding. Gramps, carrying a rifle in case any of the cows were hurt and needed to be put down, lowered his rifle toward the soldier and, quietly as could be, said, "We are going this way." No more argument. My parents divorced back in 1946 when I was two years old, I occasionally overheard a realative mention that I was 'from a broken home'. My very proper Atlanta grandmother often reminded my mother that there had never been a divorce in our family until hers. While researching military records I discovered that my gg-grandmother's first husband had been killed in the Civil War and she remarried shortly afterwards. The first husband reappeared in another state and also remarried, there was no divorce. Shortly before the end of the War the second husband was also killed. Therefore my gg-grandmother was referred to as the Widow Cater. Imagine my surprise when I discovered a letter, while researching military records, written by my gg-grandmother applying for her dead husband's civil war pension. There was a copy of her request as well as a copy of the reply informing her that her husband was receiving his own pension in another state. That information led me to finding him and another wife and family. I was later able to correspond with his descendants. My grandmother had been right, there had been no divorces in our family, only bigimists! Two of them! My Mother had a good laugh when I was able to tell her that perhaps being the first divorcee in the family was not quiet as shameful as she had always supposed. October, 1813, in the Battle on the Thames, my ancestor's horse was killed. This was a serious situation, as they could always find other men, but horses were at a premium. He was paid $10 per month, while the horse earned 40 cents per day, meaning the horse earned more than he did! Was using Find A Grave to locate relatives of son's girl friend. Got her back to NY/NJ in late 19th Century, then things vanished. Knew they came to US well before then. Puzzled over it a while, then a thought hit me. Next time I saw her, I asked if she might have Jewish relatives. Yes, she said, she did. Great grandparents. Reason I thin they didn't show on Find A Grave? There are many Jewish cemeteries in NYC and the headstones would more than likely be inscribed in Yiddish at that time, and few Find A Grave contributors can read Yiddish. So those with the interest/passion to document cemeteries just sought out those with English language headstones. Question of the Week: What's a favorite love story that you've found in your research? Question of the Week: What’s the worst job/occupation you’ve found in your research? Question of the Week: What's the most unusual name you've found in your family tree? Question of the Week: What's the most interesting news item you've found about one of your ancestors? Question of the Week: What's one of your favorite holiday photos? Question of the Week: What's your favorite old family photo? Question of the Week: What are your favorite free sites for research? Question of the Week: What are your favorite areas of genealogy research? Question of the Week: How do you keep your research organized?